The Premier League's big four have made such a habit out of challenging for Champions League glory that it is almost impossible to imagine one of them missing out on the tournament altogether. Manchester United, Arsenal, Liverpool and Chelsea have contested Europe's blue riband club competition every year since 2003, reaching at least one final apiece since 2005. What changes, if any, would you like to see made to the Champions League? But, under changes to the qualifying rounds that come into effect next season, the team finishing fourth in the Premier League could be in for a rude awakening. Liverpool needed a last-gasp goal against Standard Liege just to come through qualifying in August and now that process is likely to be even more difficult. Not for the first time, Uefa president Michel Platini is looking to shake things up. Platini wants to reduce the number of non-champions from countries such as England, Spain and Italy and increase the number of champions from the likes of Bulgaria, Slovakia and Latvia in the competition. A qualifying path will, therefore, be reserved solely for non-champions from the higher-ranked countries - and that could see England's fourth team pitted against the fourth team from Spain or Italy. "We introduced this new format after discussions with the clubs but of course there will be losers," Uefa's general secretary David Taylor told BBC Sport. "To the big clubs who may miss out I would say tough luck. This is a sporting competition and there is no guarantee of success. "This is good for European football because we are refreshing the competition and we will have increased interest with clubs who have possibly never played in the Champions League before." 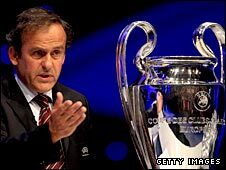 Platini has not had everything his own way - the teams finishing third in England, Spain and Italy are to gain direct entry to the group stage - but he thinks the alterations will help rejuvenate the competition and improve the quality of teams and leagues across Europe. If one of England's big four did fail to qualify for the Champions League the potential financial and sporting ramifications do not bear thinking about, even more so at a time of a global economic crisis. Clubs contesting the Champions League proper earn between £4.6m-£20.4m, a share of the £237.31m television pot and matchday income, which for each of the big four is about £3m per match. 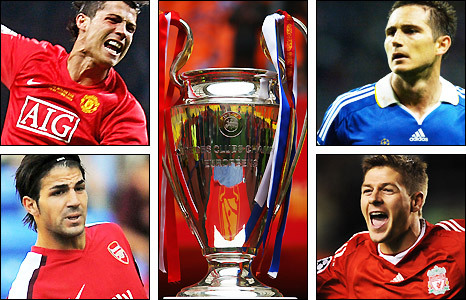 From Uefa alone, 2008 winners Manchester United earned almost £42m and runners-up Chelsea more than £36m. "Because of the massive amounts of money at stake, the English quartet all budget to reach the group stage every year and if they don't get there, they are in huge trouble," said football analyst Alex Fynn. "To do well domestically is an end in itself but it is also a means to an even bigger end, which is the Champions League." Uefa believes any hostility from the clubs is a small price to pay for making the Champions League more exciting. Taylor points to the way 2008 Champions League debutants Cluj-Napoca (Romania), Anorthosis Famagusta (Cyprus) and BATE Borisov (Belarus) have spiced up the competition. The worry is that the changes will prove purely cosmetic and critics argue that the competition has become too predictable before the knockout rounds begin each February. The eight teams originally regarded as favourites to win their groups this season have lost just four of 40 matches played. "Competitive balance is a concern and the trend in general is on the decline in all competitions," said Alex Phillips, Uefa's head of professional football services. "It's something we consider closely when making changes to the Champions League." Phillips's boss Taylor, though, concedes that the inclusion of more champions from lower-ranked countries could result in the big clubs continuing to have it their own way. When the potential changes were originally examined by Uefa's strategy council, there was support for the adoption of a total knockout format, which was how the European Cup was contested until 1991. Unfortunately for the purists, most clubs want or need the income generated by a guaranteed minimum number of games and so, for now, the Champions League will retain its current format. "These things are all a little bit cyclical and I don't think we see dominance from one particular club or country for a long period of time," said Taylor. "There are five big football countries in Europe and they will always provide the bulk of the winners. "But there are other countries, like the Netherlands and Portugal, who from time to time can produce clubs who can win tournaments and we have to continue to allow that possibility. "The changes from 2009 increase the chances of that happening and anything we can do to that extent helps." Fynn, for one, applauds the changes, arguing that the big clubs have had things their own way for far too long. "In many sports people talk about the podium but the podium only has room for three," he said. "Finishing first, second or third in a big league should give you right of entry into the group stage. "Likewise if you finish first or second in a smaller league, or as champions in the smallest leagues. "But fourth? A fourth place was only introduced when Uefa were trying to prevent the big clubs from forming their own break-away competition."